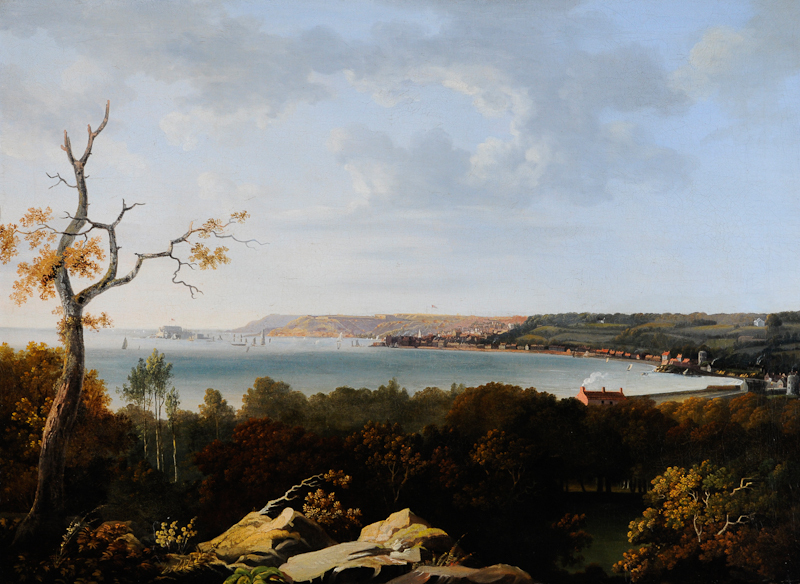 Although this wonderful panoramic view of St Peter Port by Tobias Young was painted during the late 18th or early 19th century it undoubtedly harks back in style and composition to Dutch and Flemish landscape painting of the 17th century. The tonal effects and strong use of dramatic light in Young's painting are similar to that used by artists such as Jacob van Ruisdael, the Dutch 17th century landscape painter. Dutch and Flemish painters of the 17th century often used a single motif, such as a tree, tall sailing boat or windmill and set it against a dramatic sky, very much as Young has done in his painting of St Peter Port. The bare tree placed to the far left pierces vertically through the otherwise horizontal composition creating drama and interest within the painting.